The ability to sell others is as critical to your success as food, water and oxygen is to life. Every person on this planet is required to sell their ideas in order to advance themselves and achieve their goals. To do it well requires gaining the attention of others. In this high-energy, captivating program, legendary speaker/trainer Grant Cardone will teach you how to gain more attention, pump up your attitude, expand your goals, overcome objections and sell more effectively than ever before. Grant Cardone is an internationally sought-after motivational speaker, sales trainer, and New York Times best-selling author. Over the past 25 years, he has positively affected hundreds of thousands of people worldwide. 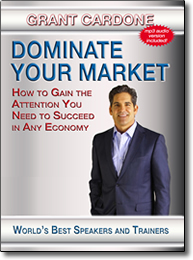 Now, you can virtually attend a Grant Cardone seminar through this dynamic DVD presentation.